CHANDIGARH, AUG 5 : K. Prem of Integral Coach Factory of Chennai held the spotlight as he leapt to a new national and meet record in long jump for men on the opening day of the 79th Railway Athletic Championship at the Jawahar Lal Nehru Stadium in New Delhi today. His clearance of 8.09 metres erased the old record of 8.08 metres standing in the name of Amritpal Singh since 2004.
ai of Eastern Railways which he had established in 1998.
. Rati Ram Saini of Northern Railway emerged a clearcutwinner in the energy consuming 10,000 metres race as he covered the distance in 30:34.41. Soji Methew of Western Railway clinched silver in 30:40.81. National champion Preeja Sreedharan of Southern Railway won gold medal in the 10,000 metres race for women with a timing of 34:51.05. Preeja had established a national record of 31:50.47s in the Asian Games in Guanzhhou (China)in 2010. Railway) 48.86m; 3. Karan Singh ( Northwestern Railway) 48.15m; 1500m: 1. Sajeeh Joseph (Southern Railway) 4:01.13; 2. Vikash Lathiyan (East Coast Railway) 4:01.41; 3. Vipul Rana (Southeastern Railway) 4:02.17. 400m: 1. Bibin Mathew (Southern Railway) 47.59; 2. Neeraj Panwar (Northern Railway) 48.41; 3. Jithin Paul (Western Railway) 48.67. Shot Put: 1. Ashwani Solanki (DMW Patiala) 17.10m; 2. Satyender Kumar (North-Western Railway) 16.92m; 3. Sunil Kumar ( Western Railway) 16.10m. Long Jump: 1. K.Prem ( ICF) 8.09m; 2. 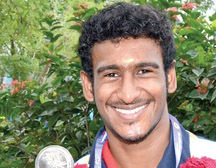 Nikhil Chittrasu (Southern Railway) 7.71m; 3. Rositto Sax ( South-Western Railway) 7.60m. 10000m: 1. Rati Ram Saini (Northern Railway) 30:34.41; 2. Soji Methew (Western Railway) 30:40.81; 3. Ajay Veer Singh (North Central Railway) 30:52.41. Women: Pole vault: 1. V.S.Surekha (Southern Railway) 3.90m; 2. Dija K.C. (Central Railway) 3.50m; 3. Anusha K.P ( Central Railway) 3.50m. Hammer Throw: 1. Manju Bala (Western Railway) 57.13m; 2. Gunjan Singh (Eastern Railway) 54.49m; 3. Sarita P.Singh (Western Railway) 54.32m. 10000m:1. Preeja Sreedharan (Southern Railway) 34:51.05; 2. L.Surya (Southern Railway) 35:03.35; 3. Sanakki Thippava (South Western Railway) 37:24.85. 1500m: 1. Jhuma Khatun (Eastern Railway) 4:25.51; 2. O.P.Jaisa (Eastern Railway) 4:26.30; 3. Sushma Devi (Central Railway 4:34.23). Javelin Throw: 1. Saraswathi (Southern Railway) 52.18m; 2. Mukesh Kumari (Western Railway) 47.02m; 3. N.M. Hemalatha (South Western Railway) 40.28m. 400m: 1. Chavi Sharawat (Southern Railway) 55.71; 2. Priyanka Mondal (Eastern Railway) 55.84; 3. Sarita (Western Railway) 56.42. 4x100m Relay: 1. Southern Railway (Sonia K.A, Chavi Sharawat. Priya P.K. ., Shardha N.), 47.03; 2. Western Railway (Akicha Gazi ., Manju P.M. ., Sajitha K.V. ., Merlin K.Joseph . ), 47.41; 3. Eastern Railway (Arjina Khatun, Tanjila Khatun , Priyanka Mondal, Asha Roy ) 47.49.